For this project each child will need an empty large cereal box, a copy of the drawing of Jesus from the Classroom Resource book (p5), brown construction paper, scissor, markers or crayons, and glue. Cut out a large arched entrance from the front of the box. It should be large enough to allow the picture of Jesus to be added inside the box. Cover the outside of the box with brown construction paper and glue it into place. Color in the picture of Jesus. Cut out the drawing of Jesus leaving about 1 inch under his feet. Fold over the extra paper under Jesus' feet and glue that onto the floor of the box in the archway so that Jesus is standing in the temple. Decorate the temple adding lines for stones on the brown construction paper. The older children could make a more detailed diorama; for example, cut out a domed window and add an outdoor scene by gluing their drawing to the back of the box. They could draw and add people learning from Jesus in the Temple. Merry Christmas from Sola Publishing! 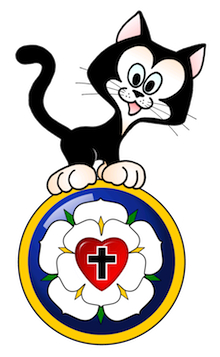 ReClaim Catechism now available through Sola!